We're rounding out this week of laundry basket games by pretending that we're in boats! The floor is hot lava, so we have to scoot along the floor in our boats. I put towels underneath the baskets so the floors were safe and the scooting was a little bit easier. In our little video, I'm doing most of the basket pushing, but after playing this game for a few minutes, Rowan was eager to try pulling her own basket towards mine. Plus, it led to a hot lava game, which is irresistible to any kid. Thanks for reading our blog this week! We hope that you enjoyed it and got some good ideas. Check back soon for more games, stories, pictures & videos! We're joined today by our friend, Piper. Our version of today's game is with water balloons, but it's easy to turn it into an indoor game with regular balloons. One person throws the balloon. The other person catches the balloon with the basket. If you're playing outside, be sure to collect all of the broken balloon pieces! Today we put scarves all around the room and used our feet like monkeys to put them into the laundry basket! Give it a try at home! If you don't have scarves, you can use socks. Or you can use this as a fun way to clean up your room. In today's episode of Inventing Games (a.k.a. 'how else can we avoid doing housework? '), Rowan and I have come up with, for lack of a better term, a 'target practice' game. Make sure that you're in a good place to throw balls at laundry baskets. This would be a great outside game, too. But we decided to set it up inside today. That being said, make sure that the basket isn't near anything breakable. Balance the laundry basket on it's side. Try to knock the basket over using a ball, rolled up socks, or, if you're outside, a hose! We've been busy bees over the past couple of months finishing up our new CD, so our blog has become a little neglected. Unfortunately, so has me little house! As I was digging my way through lots and lots of accumulated laundry, I thought that it was high time that I start up the blog again, which means coming up with fun kids games. We tried a few different versions of this game. 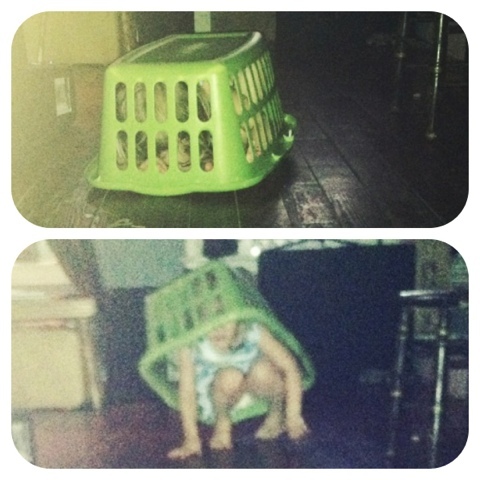 One was kind of a red-light / green-light game where Rowan crawled around with the laundry basket on her back. When I called out 'Turtle', she had to stop moving and hide beneath the basket. This seems like it would be more fun with a few kids. So we tried another variation. This one is more of a hide and seek game and was our favorite version of the game. We put a few laundry baskets upside down around the room. I counted to 20 while she hid (someplace other than a laundry basket). When I was done done counting, I went looking for her. When I found her, she had to run to a basket and hide under it (like a turtle hides under it's shell) before I caught her and tickled her. Here's Rowan playing Turtle Tag! 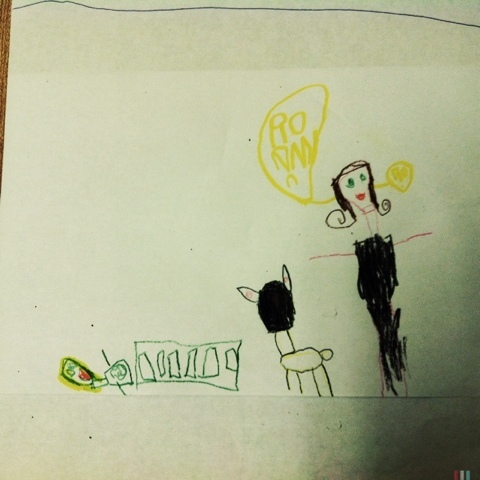 Here's a picture that Rowan drew of us playing Turtle Tag. Our dog, Sunny, was playing, too! Labels: Kids games. Children's games. Laundry basket games. Lolly and YoYo.